When school started back up, and we knew it would be less crowded, Parker and I decided to try out the new local park. It's a little bit of a drive for us, but we are usually "in town" doing other things when we go so it works out great. And any park that sits behind Hobby Lobby can't be bad, right?! 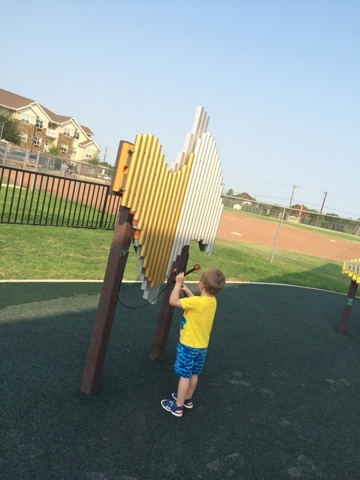 Parker LOVES parks and playgrounds so he was ever so excited to venture out to the new one in town. It did not disappoint! Most of it is covered, all of the equipment is on a squishy, foam floor and there are tons of fun things to play with and on. These pictures are from the first two times we went, but we've been a few times already - he enjoys it every time and is always excited to go. This was after the first time we went. We came home and ate lunch, then we snuggled and rocked...and he crashed - all while holding his mighty backhoe. Sweet boy! Here we are in October and I'm still trying to play catch up with the ol' blog from the last month or so - tis life! At the end of August, we made a weekend trip to San Antonio to take Parker to Sea World. He had mentioned for months that he really wanted to go. Parker is all about sea creatures and ocean animals. We've gone to the aquarium a couple of times and he loves it. We were hopeful he would really enjoy Sea World. 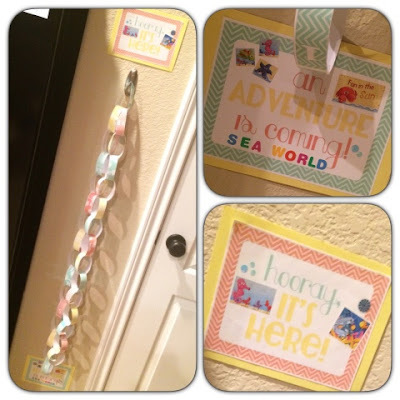 No exciting event is complete without a paper chain countdown. We've made a few countdowns over the past year or so and they have been fun and helped build the anticipation! These are by no means all of the pictures. Between my phone, John's phone and our camera we took over a hundred pictures so this is just a taste of our trip. I wish I could post them all, but there are so many!